More than something to wear with style, these scarves are designed to help protect people from the modern threats of pollution. According to the World Health Organization, in 2012, approximately seven million people died prematurely as a result of exposure to air pollution. Of those deaths, the WHO estimates that about 3.7 million were linked to outdoor air pollution originating from both urban and rural sources. So who is going to come to the rescue? French startups with an eye and mind for fashion tech, that’s who. 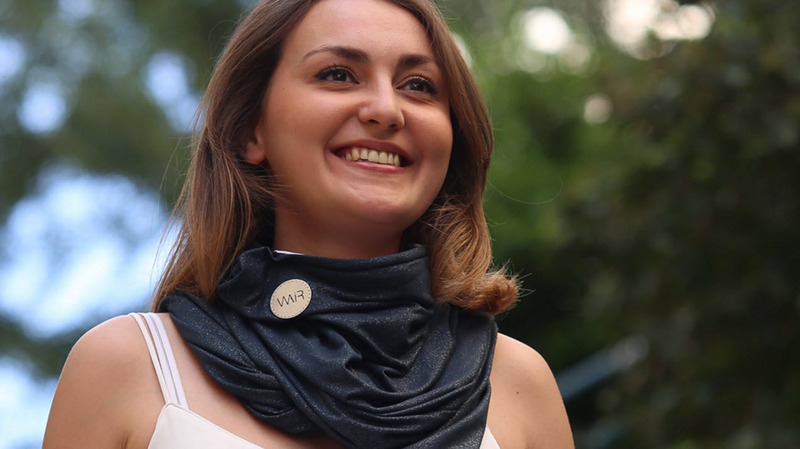 WAIR is launching a crowdfunding campaign on October 27th; the product is a scarf that isn’t just stylish, but one designed to filter out pollutants and relay essential information about air condition to the wearers through a connected smartphone app. The creator, Caroline Van Rentergherm, recently earned recognition in the Cisco Young Entrepreneurs Challenge for her innovative and fashion-forward “wellness accessory.” Caroline’s inspiration, clearly implied in the company’s marketing materials, occurred during cycling; the more she cycled, the more her eyes watered, the more her throat became sore, and the more uncontrollable became her coughing. Although she tried a variety of anti-pollution masks, they either looked horrible or they didn’t do a particularly good job. After using her everyday scarf to protect her from exhaust fumes, she was inspired to take the concept a step further and create WAIR. The scarf, comes in a variety of styles and colors and connects with a sensor to measure the levels of pollution in the area. When the sensor comes in contact with pollutants, it activates the companion smartphone app which then alerts the user to put on the scarf. The app also keeps track of air quality based on emissions data gathered from the scarf. Van Rentergherm is also planning to add personalization into the mobile app; public data available on air quality will be aggregated and analyzed so that people may enter particular inquiries and concerns—for instance, allergens—and then receive alerts when those variables reach a notable presence. This isn’t the first fashion tech brand designed to protect us from and inform us of pollution. Warning Signs is a line of pieces that visualizes ambient pollution; the shirts start by depicting lungs or a heart that is pink at first, but then display blue veins as carbon monoxide levels rise around the wearer. 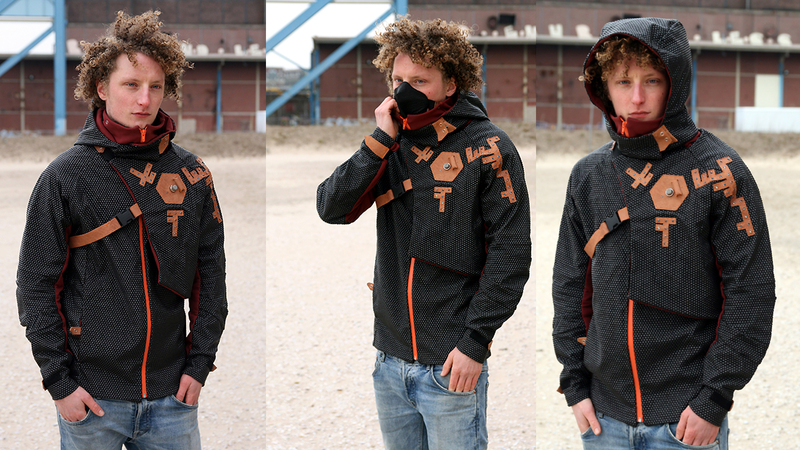 A design company based out of Holland, Nieuwe Heren, offers the Aegis Parka; the jacket uses LED signals to reflect pollution intensity, is treated with a titanium dioxide solution—designed to clean the air around it—and includes a built-in respirator with a carbon filter. Getting enough people wear these kinds of garments to support a thriving fashion niche may is a initiative fraught with doubt; mixing “reality” with fashion, if not sacrificing the latter for the former, can often be uphill business. But maybe fashion can be the next viral platform for the conversation. As access to the technology improves, so to can its (literally) seamless integration in our wardrobes, and then perhaps our broader social and environmental investments. Perhaps a little bit of “awairness” can go a long way. I love these. I would take the fashion a step further and get a license from the major sports teams as well! I really like the aspect of the app. Sometimes you might not realize that you are breathing in pollutants and getting that alert could really be essential to the success of this product. There are so many ways that you could make these customized. Great idea and good luck to the inventor! It was only a matter of time after seeing the other side of the world completely concerned with what is flying around in the air. Making this more of a fashion statement than a protective device was a gold idea!